Cream Cheese is blended with finely-crushed almond crackers, chile powder and celery salt, then pressed into halved (or slit open) and seeded jalapeño peppers. Placed in a baking dish and baked in a 400F oven until lightly browned, these cocktail offerings can be served warm or room-temperature. 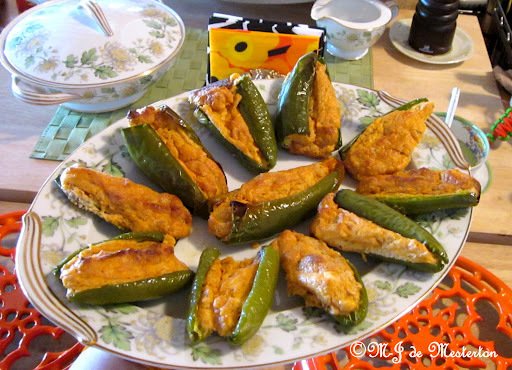 Besides tasting great, stuffed piquant peppers prepared this way are low in carbohydrates. This elegant dip straight out of the 1960s has two ingredients: pineapple and cream cheese. Drain and chop the pineapple–I prefer the canned type without added sugar–and blend with sightly-softened cream cheese. The crackers you serve with this cream-cheese-pineapple dip ought to be the original, plain Ritz brand. Acceptable substitutes are Townhouse or Waverly crackers. I like to use coconut milk in puddings, pies, cakes and in my coffee. It is smooth, delicious and one 403 ml can contains only fifteen grams of carbohydrate. One-third of a cup has but three grams of it. Coconut milk is good for marinating and poaching chicken, for grilled hors d’oeuvres on skewers, and in savoury main-dishes. You don’t have to throw out your tortillas if they are past their prime. Make them into tortilla chips, which will be very popular with your family and guests, as they are pleasingly different from those bought in the store.Take a stack of tortillas and dust between the layers with salt, pressing it into them. Then, pushing down hard with a large knife twice at different angles, cut the stack into quarters. Lower a handful at-a-time of uncooked chips into bubbling hot oil. For this light and crispy batch, I used a combination of soy oil, which is now sold as “vegetable oil”, and lard. Peanut or corn oil are also good for deep-frying tortillas. When the chips themselves have developed bubbles and are slightly brown, it’s time to remove them from the pot with a runsible or slotted spoon. Drain them on paper towels, and dust with more salt if desired. The cooking oil may be strained, refrigerated and re-used for French fries, yams or potato chips. My recipe for Elegant Guacamole goes very well with these tortilla chips. So do sour cream or crème fraîche, and a mixture of sliced jalapeños with melted Cheddar cheese, baked on top of the chips for a few minutes in a hot oven. For green chile powder, which is a good substitute for chopped canned or frozen New Mexico green chiles, go North of the Border. 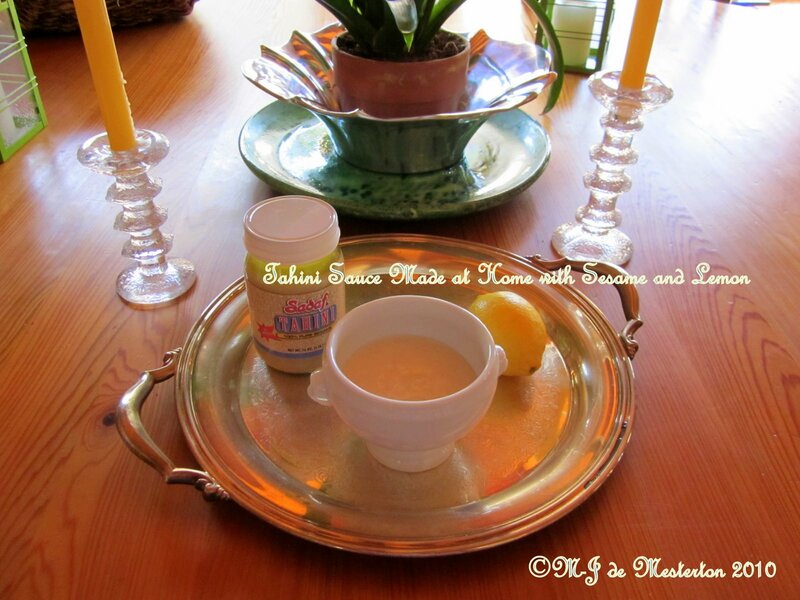 Sesame paste mixed with lemon juice, water, salt and the merest hint of garlic powder makes an elegant tahini dip or sauce for mezedes, or pre-prandial appetisers. Use this elegant and simple tahini sauce as a dip for flat-breads, steamed cauliflower, celery, other fresh vegetables, and fried potatoes. Optionally, you may drizzle olive oil over the tahini. 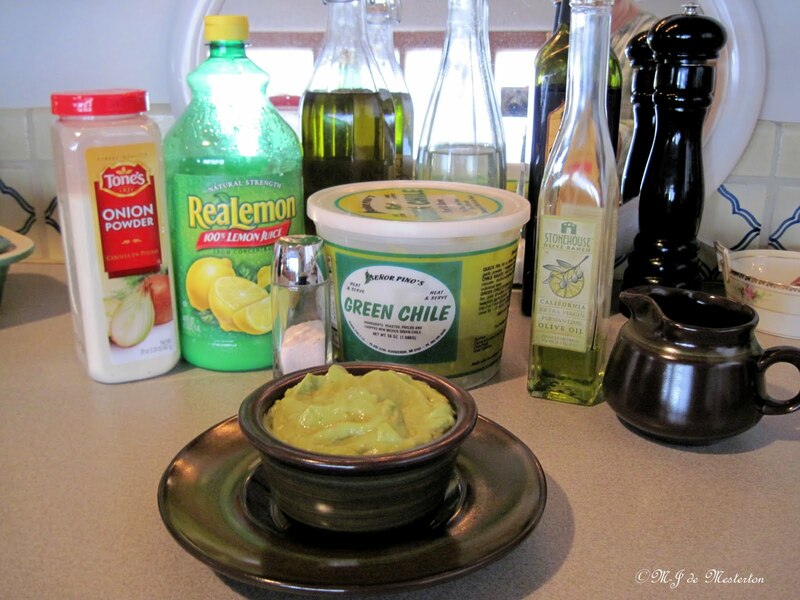 People find tahini sauce very pleasing in the summer months, and it is economical to make, since the sesame paste expands greatly when mixed with water and lemon juice. Tomatoes are a good source of vitamin C and potassium. They also contain plenty of phytochemicals that inhibit the development of certain degenerative diseases. Tomatoes are high in the strong antioxidant lycopene, and some phenolic compounds. In the average western diet, 95% of lycopene intake comes from tomatoes and tomato products. It is also found in watermelon, rose-hips, red grapefruit, and papayas. Lycopene is the carotenoid that gives tomatoes their red tint. It appears that lycopene can reduce one’s susceptibility to certain cancers, the eye disorder known as age-related macular degeneration, atherosclerosis, and mitigate skin-damage from over-exposure to the sun. Men who eat two or more servings of tomato products experience an average of 35 percent-less incidence of prostate cancer. According to research done by the University of Illinois at Chicago, lycopene helps women to prevent the development of cervical intra-epithelial neoplasia (CIN), a tumorous tissue-growth in the cervix. Lycopene is a powerful inhibitor of the growth of breast, endometrium (inner lining of the uterus) and lung-cancer cells. Some nutrients are, unfortunately, cooked away from other vegetables, but lycopene is better absorbed by the body when the tomatoes in which it is inherent are cooked with oil, as in a tomato sauce or paste. This is good news for those who like Italian and Mexican cooking, as well as for adherents of what is known as the Mediterranean diet. The cooking helps to break down the cell walls of the tomato releasing the lycopene and the oil helps to increase its absorption. Japanese scientists have determined that mixing tomato juice into the drinking water of mice prevented them suffering the sort of emphysema that is brought on by the inhalation of tobacco-smoke. Tomatoes contain lutein. Lutein is found in the retinas of our eyes, thus its ingestion promotes good vision. This substance also is believed by scientists to lower the risk of cataracts and macular degeneration, two negative eye-conditions. Lutein may also help to prevent atherosclerosis, or hardening of the arteries. Atherosclerosis contributes to cardiovascular disease. Tomatoes and tomato-products are known to be effective in arresting aggressive, metastasizing cancers. Tomatoes are believed to have originated in Peru, and were introduced into Europe in the 16th century. The genus tomato’s Latin name is Solanum Lycopersicum. There are so many health-benefits from tomatoes, and such a variety of pleasant ways to ingest this colourful plant, that they are truly a gift from the western hemisphere to the rest of the world. 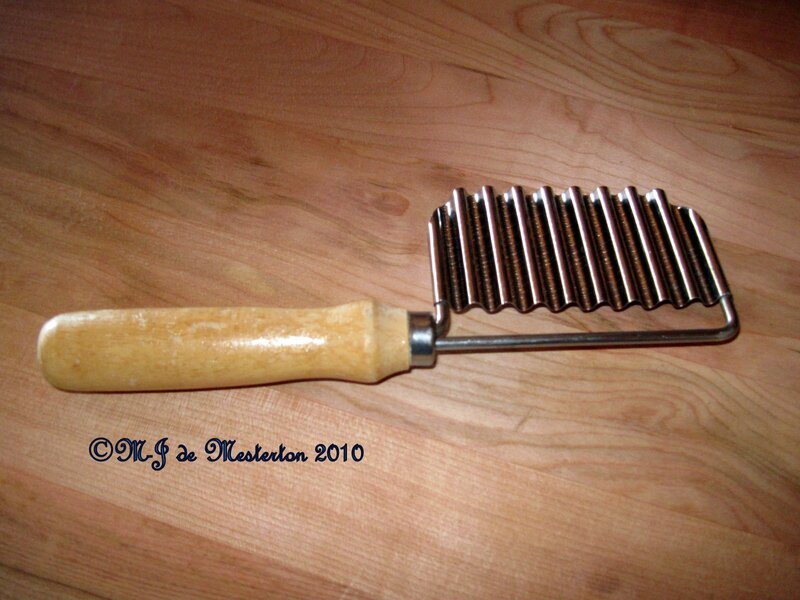 I use these wavy-bladed crinkle-cutters for making summer hors d’oeuvres with cucumbers.